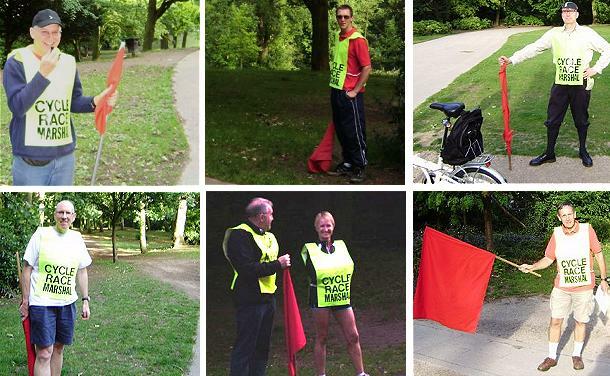 Once a year the Club is responsible for marshalling the Crystal Palace Criterium. This year it was the balmy evening of 14th June. Cycle racing on a closed circuit under the control of British Cycling. Held every Tuesday evening, weather permitting, from April to August. Mass start in the straight, down to 180 degree hairpin around a tree with a metal bollard exactly where you leave the track if you fail to get around the bend! Back to the Start area and sharp downhill right hander and carry on down to the Lake. 90 degree left hander with right side of track falling away downhill to trap you if you make a mistake. Left hand bend at bottom of Lake, the lowest point of the course, start to climb through the trees. Pleasant enough when you are warming up but cruel on the legs at race speed in the bunch. Having survived the climb, left downhill to the Finish line and the start of another lap. A couple of laps before the finish the lapped riders are pulled out, how the Officials know who has been lapped, I know not, and the remainder race for the Finish Line and the Prize Money! They say that if you can ride the Palace Circuit you can ride any circuit race. Finally a BIG thank you to the Anerley whose members and friends gave up their time to support Cycle Racing and the ‘pleasure’ of the competitors. ← May Day: We are going to the seaside!